Map of the British Provinces of North America. 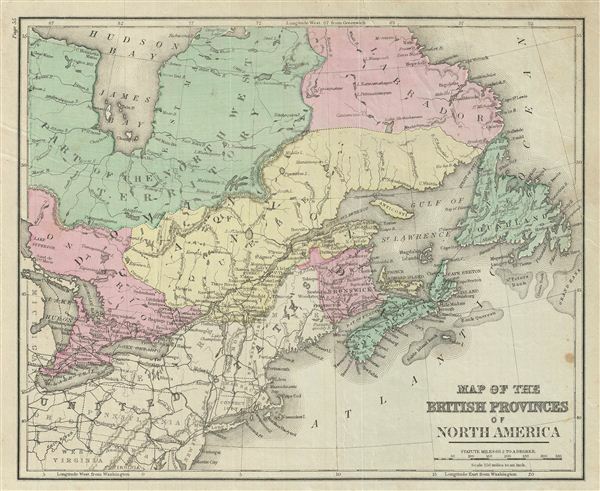 This is an example of David M. Warren's 1879 map of Canada or the British Provinces of North America. It covers from the Clear Water Lake in Ontario to New Jersey in the United States and from the eastern end of Lake Superior as far east as Newfoundland. According to the earliest written accounts, the Russians were the first europeans who reached Alaska and eventually became permanent settlers. The modern Canadian provinces and territories were under British and French control from the 16th century, until France gave up its claims in the Treaty of Paris in 1763. Canada would remain a collection of British colonies until its confederation in 1867, when the British Province of Canada was divided into Quebec and Ontario and the British colonies of New Brunswick and Nova Scotia incorporated as Canadian provinces. With the signing of the 1854 Treaty of Reciprocity between the United States and Canada, this area experienced a period of sustained growth and prosperity. The increased international trade that flowed into Quebec via the Hudson Valley inspired popular interest in the region. Montreal, Three Rivers, and St. Francis in particular benefited from the cross-border trade. Throughout, the map identifies various railroads, cities, towns, rivers, islands, mountain passes and an assortment of additional topographical details. The map is color coded according to regional and political boundaries with elevation rendered by hachure. Issued as page 55 in the 1879 edition of Warren's Common-School Geography. Very good. Even overall toning. Text on verso. Verso repair near top margin.